This article is about a sac filled with a coolant. For sea ice, such as the Arctic ice pack, see drift ice. "Cold pack" redirects here. For the cheese, see Cold pack cheese. Look up ice pack in Wiktionary, the free dictionary. An ice pack or gel pack is a portable plastic bag filled with water, refrigerant gel, or liquid. For use the contents are frozen in a freezer. Both ice and other non-toxic refrigerants (mostly water) can absorb a considerable amount of heat before they warm above 0 °C, due to the high latent heat of fusion of water. These packs are commonly used to keep food cool in portable coolers, or as a cold compress to alleviate the pain of minor injuries, or in insulated shipping containers to keep products cool during transport. Ice packs are used in coolers to keep perishable foods (especially meats, dairy products, eggs, etc.) below the 5–75 °C (41–167 °F) danger zone when outside a refrigerator or freezer, and to keep drinks pleasantly cool. The amount of ice needed varies with the amount of food, its initial temperature, the thermal insulation of the cooler, and the ambient temperature and exposure to direct sunlight. Ice initially well below freezing temperature will last a little longer. Water has a much higher latent heat of fusion than most substances, and a melting temperature which is convenient and easily attained with, for example, a household freezer. Additives to improve the properties of water are often used. For example, substances can be added to prevent bacterial growth in the pack, or to prevent the water from solidifying so it remains a thick gel throughout use. Gel packs are often made of non-toxic materials that will remain a slow-flowing gel, and therefore will not spill easily or cause contamination if the container breaks. Gel packs may be made by adding hydroxyethyl cellulose (Cellusize), sodium polyacrylate, or vinyl-coated silica gel. 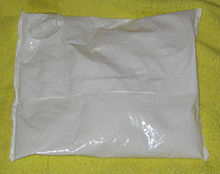 An instant cold pack is a device that consists of two bags; one containing water, inside a bag containing ammonium nitrate, calcium ammonium nitrate or urea. When the inner bag of water is broken by squeezing the package, it is allowed to dissolve the solid in an endothermic reaction. This reaction absorbs heat from the surroundings, quickly lowering the pack's temperature. Instant cold packs are a convenient direct replacement for crushed ice used as first aid on sport injuries, and can be carried as first aid to remote or wilderness areas where ice is unavailable. Unlike instant cold packs, that are stored at room temperature and quickly chill themselves when needed for one-time use, reusable hot cold packs are merely a material that holds its temperature well, so they are stored in a freezer or heated in water or a microwave oven to reach the desired temperature. The first hot and cold pack was introduced in 1948 with the name Hot-R-Cold-Pak and could be chilled in a refrigerator or heated in hot water. The first reusable hot cold pack that could be heated in boiling water or a microwave oven was first patented in 1973. Gel packs have been made with diethylene glycol and ethylene glycol both of which can cause illness if ingested in large amounts, making them unsuitable for use with food. 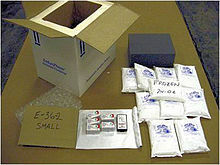 The US Consumer Product Safety Commission recalled such packs. Wikimedia Commons has media related to Ice packs. ^ Singh, S P; Burgess, Singh (2008). "Performance Comparison of Thermal Insulated Packaging Boxes, Bags and Refrigerants for Single-parcel Shipments". Packaging Technology and Science. 21: 25–35. Retrieved 9 Oct 2018. ^ "Versa-Pac™ Reusable Heavy Duty Cold Pack" (PDF). Unipatch: Material Safety Data Sheet. Tyco. February 2004. Archived from the original (PDF) on December 30, 2006. Retrieved 2009-06-01. ^ "CELLOSIZE Hydroxyethyl Cellulose (HEC)". UCAR Emulsion System Products. Dow. Archived from the original on September 14, 2008. Retrieved 2009-06-01. ^ "The Chemical In Gel Ice Pack Bag: Sodium Polyacrylate". Super Absorbent Polymer Supplier | SOCO Tech. 2018-06-07. Retrieved 2018-06-08. ^ Marshall Brain. "Cold Packs". How Refrigerators Work. Howstuffworks.com. ^ "To Warm or Cool You." Popular Science, August 1948, p. 138. ^ a b "California Innovations Expands Recall of Freezer Gel Packs Due to Ingestion Hazard". CPSC.gov. Retrieved 2014-08-06. This page was last edited on 8 April 2019, at 16:21 (UTC).